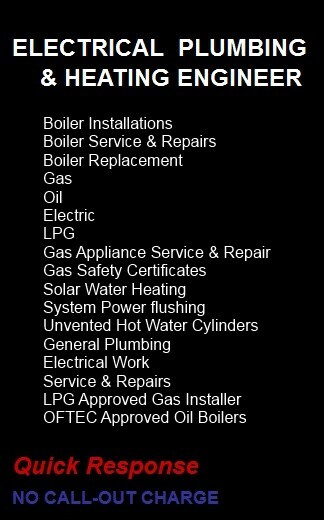 Blue Flame Gas 24/7 is Lal Jayaweera, a fully qualified and experienced electrical, plumbing and heating engineer. Almost all of our work comes through word of mouth and personal recommendation. We are happy to let you have testimonials from existing customers. We are not members of check-a-trade, rated people or trustatrader; good as some of these schemes are, while they appear free to you, the consumer, the trader has to pay to join the scheme and in some cases for leads resulting in jobs. This cost then can only be recovered from you, the customer. Membership and registration of professional bodies governing the quality of workmanship is a reliable way to ensure the quality, safety, promptness and courtesy of any work done. Please see the Qualified page for details of qualifications and professional recognition held by Blue Flame Gas 24/7. See the Gallery page for examples of completed work. Please contact us for a quick response, personal service, no call-out charge and reliable quality work.